The Customer Service office handles all activity relating to your utility account. You can set up or close an account, pay your bill and make account inquiries. Located at the City Hall Complex, 603 West 10th Street, the Customer Service office also offers a convenient drive-thru for utility bill payment, found off of the 7th Avenue entrance of the complex. Download the Rock Falls Utility brochure, which contains the information necessary to protest an issue with your utility billing. The City of Rock Falls may provide any or all of the following services at your location: Electric, Water, Sewer and Garbage If you are a new resident of Rock Falls or relocating within Rock Falls you will need to complete a Rock Falls Utilities Application for Service. Upon completion, the application must be submitted to our Customer Service Office in person. Applications will only be processed during normal hours of operations. A copy of your Illinois Driver’s License or Identification Card will be required at time of application. Payment experience with other utility providers. The amount of deposit is determined based upon the credit score from Experian’s national credit repository. An Application for Commercial Service must be completed. All information must be completed including property owner information for rented commercial property. If applicable, the Illinois State Sales Tax Number for the business should be submitted with the application. A copy of the current Illinois Identification Card or Driver’s License will be required at the time of application. Applications will not be processed if the applicant has a PAST DUE account. An amount equal to one (1) month’s average utility bill will be required of all retail businesses regardless of utility services provided. Established Utility History: When the utility history is available on a service location where a similar large retailer has previously been located and the new owner intends to carry on business substantially as in the past, a twelve (12) month average of the bills for the previous retailer shall be used to calculate the amount of the deposit. No Established Utility History: When no utility history is available on a service location, a similar large retailer’s twelve (12) month average of the bills shall be used to calculate the amount of the deposit. An amount equal to one (1) month’s average utility bill will be required of all restaurants regardless of utility services provided. Established Utility History: When the utility history is available on a service location where a restaurant has previous been connected to the RFU, a twelve (12) month average of the previous restaurant shall be used to calculate the amount of the deposit. No Established Utility History: When no utility history is available on a service location, a twelve (12) month average for a similar restaurant shall be used to calculate the amount of the deposit. Established Utility History: When the utility history is available on a service location and the new owner intends to carry on business substantially as in the past, a twelve (12) month average of the bills for the previous owner shall be used to calculate the amount of the deposit. No Established Utility History: When no utility history is available on a new industrial service location, the Department Superintendents from the Electric, Wastewater and Water Departments shall evaluate the manufacturing process of the industry and determine the required deposit and amount to be credited to each utility service. Deposits are refunded to the customer after 24 months continuous service if there have been no delayed or late payments. A customer requesting termination of service shall apply for and request a refund of any excess deposit after the deposit has been applied to any unpaid or current amount due. The City of Rock Falls shall have the right to require proof of authority to receive the deposit of any person purporting to act on behalf of the maker of the deposit, as executor, administrator, guardian or under any power of attorney. If you are a landlord of a residential, commercial or industrial property and you are 60 days or more delinquent on any of your accounts, new tenants will be denied service until such time that you have paid your balance in full. Landlords are required to complete a Blanket Application and Record of Service. Please make sure that we have your correct contact information in case of emergency or problems with the utilities at your rental property. It is imperative that all tenants apply for service prior to moving into the rental property so that the utilities will be billed to the proper account. Communication is the key to a successful partnership with the Rock Falls Utilities. Please let us know when the status of your rental property changes so that we may keep our records current. All tenants of any residential, commercial or industrial property shall complete and sign an Authorization to Release Information form at the time of application for service. This Authorization allows the City to send the Landlord a duplicate Notice of Disconnection and to also give you information regarding the utilities at your rental property. If a tenant owes utility charges from a previous location in Rock Falls the tenant will not be allowed utility services at a new location until all delinquent charges are paid in full. A Rock Falls Utilities Application for Service and Deposit Record must be completed for the rental property. All information must be completed including owner information for the rental property. A copy of a current Illinois Identification Card or Driver’s License must be presented along with Social Security numbers which must be obtain from each applicant for utility service. Upon disconnection of the utility services on your rental property, when the water and sewer service of a property is still connected to the supply system, the capital improvement and debt charges will continue to be incurred monthly. A bill shall be generated each month showing the additional monthly capital and debt charges and be sent to the customer with a duplicate bill sent to the Landlord or Property Manager of the rental property. When the account is 60 days delinquent from the last billing date and no attempt of payment has been made by the last known tenant, the tenant’s account shall be sent to the State of Illinois Comptroller’s Local Debt Recovery system for collection through the State of Illinois or any third party collection agency that the City chooses to employ. Also, when the account is 40 days delinquent, the capital improvement and debt charges will no longer be charged to the tenant’s account, all future capital improvement and debt charges will be billed to the landlord of the rental property, regardless of the status of the rental property until such time that a new tenant has applied for utility service at that rental property. The City of Rock Falls will not hold the landlord responsible for the tenant’s past due bill, however, it is imperative that you contact the Rock Falls Utility Office and let us know the status of your rental property and when tenants have moved into or out of the property. Your cooperation is imperative in assisting us in keeping our accounts receivable losses to a minimum. The City of Rock Falls offers a program for landlords which allows the utilities to be turned on in the landlord’s name after a tenant leaves without the landlord having to contact the City each time. Landlords are required to complete a Blanket Application and Record of Service. Pay in Person — Walk in payments may be made at the Utility Customer Service Office located in City Hall at: 603 West 10th Street. Drive-Thru Payments — For fast, convenient service, try our drive-up facility located on the west side of City Hall complex at: 603 West 10th Street. Night and Weekend Drop Box — A drop box is located on the west side of City Hall complex in the drive-up facility at: 603 West 10th Street. Automatic Bill Payment — Free utility bill paid automatically from any participating Bank, Savings and Loan, or Credit Union account (see below). Online Bill Payment and E-Billing — Rock Falls Utilities Online Payment Center Powered by Payment Services Network (see below). By Clicking Above, You Are Leaving the City of Rock Falls Site. This link takes you outside the City of Rock Falls website. It is provided as a convenience and the City of Rock Falls is not responsible for the material on the site you’re about to visit. Sites linked from the City of Rock Falls website are not under the control of the City of Rock Falls. The City of Rock Falls does not assume any responsibility or liability for any information, communications or materials available at such linked sites, or at any link contained in a linked site. The City of Rock Falls does not intend these third party links to be referrals or endorsements of the linked entities by the City. Each individual site has its own set of policies about what information is appropriate for public access. User assumes sole responsibility for use of third party links and pointers. Contact Information that allows us to communicate with you, including your name, address, telephone number and email address. Billing Information related to your financial relationship with us, including your payment data, credit history, credit card number, Social Security number, Driver’s License or other identification, and service history. We obtain it from other sources, such as a credit agency or third party collection agency. Obtain payment for services that appear on your City of Rock Falls utility billing statements; including the transfer of delinquent accounts to third parties for collection. As a user of the City’s E-Billing system, you have made a decision to cut down on the amount of paper that is sent to you via the regular mail system. We respect and appreciate this decision you have made. Each month the utility bill includes information which is inserted in your utility bill envelope. This section provides residents an opportunity to look at those utility bill inserts so you won’t miss any important news or information. Please click below to view our utility bill inserts. Electric Usage – The amount of Kilowatt-hours used during the billing period. Distribution Charge – The cost of distributing power through the utility system. Capital Cost Recovery – Rate of return on investment paid to the General Fund of the City. Purchase Power Adjustment – A credit or charge that reflects the changing cost for generation and delivery above or below our base cost. Electric Customer Charge – This charge provides the funds for the operation of a Customer Service Office. Water Usage Charge – The amount of units used during the billing period. One unit is 748 gallons. Water Minimum Charge – All customers pay for the first three (3) units of water as a minimum charge regardless of whether or not the customer actually uses three (3) units of water during the billing period. Water Capital Improvement – Each bill includes a monthly charge which is allocated to the Capital Improvement Fund to maintain the existing water delivery system where no debt is incurred. Water Debt Charge – This charge is allocated to pay debts incurred to improve the water delivery system. Sewer Usage – Sewer usage is based on the number of water units used during the billing period. Sewer Minimum Charge – All customers pay for the first three (3) units of sewer as a minimum charge. Sewer Capital Improvement – This charge is used to pay for the new wastewater treatment facility which was completed in July 2011. It is based on the units of water used during the billing period. Garbage – The monthly fee charged for curb-side pick-up of household refuse and yard waste. 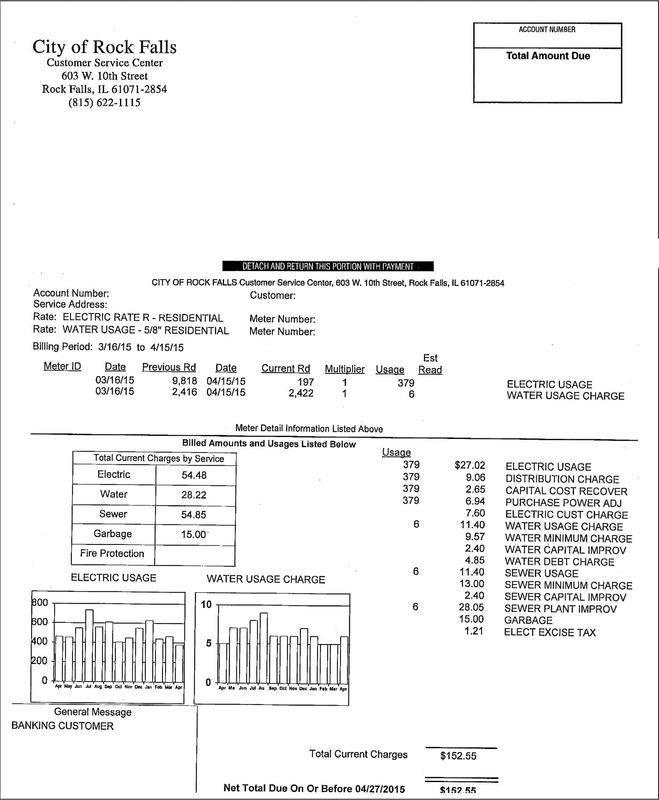 Electric Excise Tax – This charge is mandated for all electric customers in the State of Illinois and is sent to the Illinois Department of Revenue. The Low Income Home Energy Assistance Program (LIHEAP) offers cooling grants to at-risk applicants. For more information from the Governor’s office, download this press release. LIHEAP Households interested in applying can get a complete listing of LIHEAP’s local administrating agencies and additional information about the grant program by going to www.liheapillinois.com, or by calling the toll-free LIHEAP information line at 1-800-252-8643 during business hours Monday through Friday.